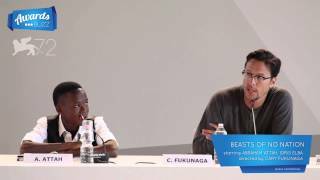 Beasts of No Nation trailer. The Netflix of Africa brings us Beasts of No Nation, a drama based on the experiences of Agu, a child soldier fighting in the civil war of a West African country. When civil war tears his family apart, the young West African boy is forced to join a unit of mercenary fighters and transform into a child soldier. Beasts of No Nation is a 2015 West African war drama film directed, written and filmed by Cary Fukunaga. The movie is based on the 2005 novel of the same name by Uzodinma Iweala. Starring Idris Elba, Abraham Attah, Ama K. Abebrese, Grace Nortey, David Dontoh and Opeyemi Fagbohungbe. 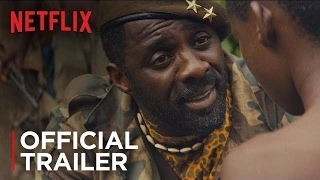 The Netflix of Africa film is scheduled to be released on Netflix globally on October 16, 2015 and the same day, the film will be released in a limited cinema release by Bleecker Street. Beasts of No Nation is a Netflix Original Film. Available in select theaters and on Netflix October 16.
is gud to remember our past tears,is da youngboy an actor?is he a street nike,dat na boy fighter.